Palm brakes growing on steep slopes in the Caribbean are characterized by low species richness, simple community structure, and temporal and spatial variations in community structure. 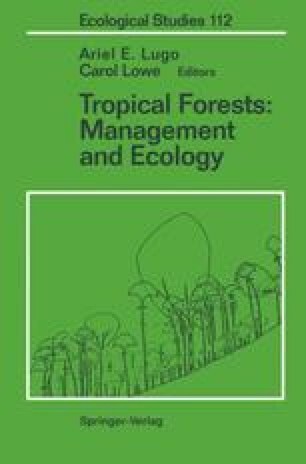 Two Prestoea montana palm forest stands were studied in the Luquillo Experimental Forest over a period of 40 years in order to determine the successional status of the palm brake. The stand with the greater rainfall had fewer tree species, greater species dominance, and lower turnover of species than the stand with less rainfall. Soil structure and chemistry varied widely both vertically and horizontally and could not explain spatial changes in stand structure. Dicotyledonous trees grew larger in the better-drained sites with deeper soils on top of ridges or on steep slopes. Palms dominated swales and waterlogged areas. The combination of geological, climatic (including storms and hurricanes), and geomorphic conditions resulted in a frequently disturbed palm brake environment. The biotic response to such conditions appears to be cyclic successions characterized by a small group of species that replace each other, catastrophic mortalities, rapid growth rates after disturbance, and permanence of the palm forest physiognomy. We suggest that succession in palm brakes follows different directions depending on type of disturbance and site conditions. Site conditions are variable in spite of always being wet and geomorphologically unstable.